The band had great fun on Friday when Lloyd Coleman came down from Chetham’s for his first rehearsal of Jubilation, which he wrote especially for us. Jubiliation is a dynamic work, with plenty of ebb and flow in its development, and drama in its conclusion: something for the band to get its teeth into, and much for the audience to enjoy. 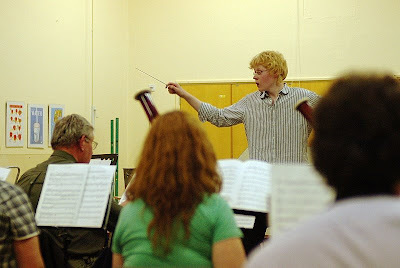 Lloyd knew how he wanted us to perform, and through his good humour, and meticulous and energetic conducting, communicated that to the band. Anyone who wants to hear Jubiliation’s premier performance - with Lloyd conducting - should book tickets for Beenham Band’s anniversary concert at the Newbury Corn Exchange on 20th June, when it will feature in our spectacular and wide-ranging programme.